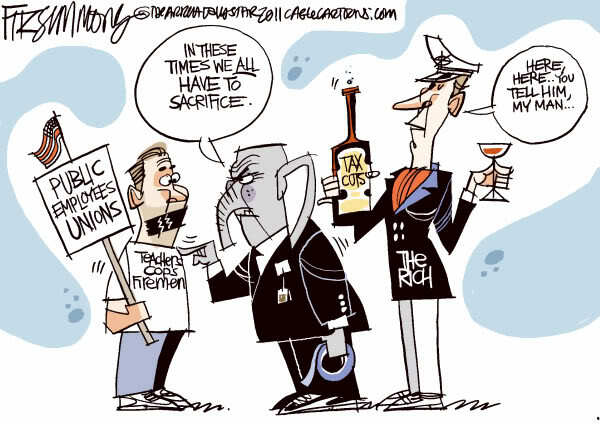 The race for Kansas Governor to determine if we free-fall back into the Brownback policies that brought ruin upon our schools and our state (and made him the least popular Governor in America) OR if we move forward with common sense policies that support our constitution, our schools, and our students- has been and continues to be a dead heat. This week, the Kobach campaign is pulling out all the stops to energize their extreme-right base to vote as President Donald Trump will be taking time away from federal investigators to host a campaign rally in Topeka. Speaking of the Trump / MAGA / Kobach rally, we’ve been asked what’s the best way to counter the anti-public education, anti-worker, anti-civility message President Trump will likely bring with him on Saturday. The answer is astonishingly simple. Vote. The purpose of a rally like the one we’ll be hearing about on Saturday is three-fold. First, it is an effort to energize the conservative base of voters to get out and vote for two highly toxic candidates. 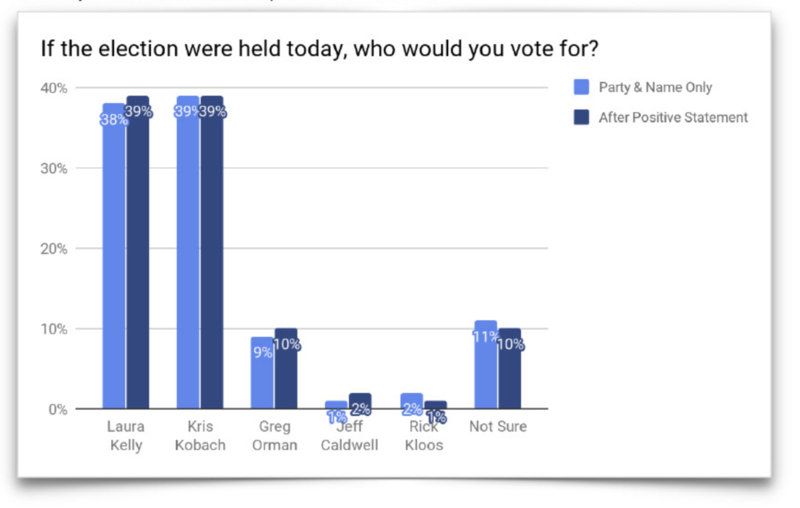 Kobach’s polling has consistently shown that his overall UNFAVORABILITY is higher than his favorability. Not surprising given that he’s promised to double-down on Brownback’s ruinous policies. On the federal ticket, President Trump is also expected to endorse Watkins over Paul Davis as a last-ditch effort to convince voters that Watkins didn’t deserve the attacks leaders in his own party levied against him during the primary season- calling him a charlatan and a phony. The problem is, it turns out he is exactly what they claimed, a phony. Instead of the “high-adventure hero” he has claimed to be, Watkins’ highest adventure might be leaving one of his residences in Alaska to take a trip to Kansas- you know the state he wants to represent but allegedly doesn’t reside in. Second, Trump’s rally is an effort to dominate the media cycle for his endorsed candidates. He wants to draw attention away from the real issues and real solutions the opponents of Kobach and Watkins are addressing with potential voters. The simple fact is, this event will dominate the media cycle. Efforts to piggy-back that cycle with counter-activities would come at a great expense while pulling focus towards the circus rather than the real issues at stake during this election season. CLICK HERE to view alternatives to the Trump rally. Third, speaking of pulling focus, the energy spent on counter-activities might energize some voters who may have been waiting for a reason to get involved. While that’s certainly not a bad thing, spending time, energy and money trying to out-shout Trump zealots, is probably futile. Take a look at the most recent polling data in the image above. 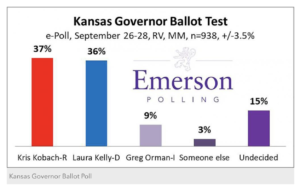 The most important data in the poll is that 15% of likely Kansas voters are undecided. Instead of spending time trying to convince those Trump zealots that they’re wrong, we encourage you to work Saturday (and every day until election day), to convince those undecided voters that there is only one candidate for Governor who supports public education, ALL students, and our constitution. That candidate is Laura Kelly. One final thought. We’re hearing from members and non-members that they’re worried about voter-turnout during the mid-terms because they know that candidates like Sam Brownback and Kris Kobach get elected in Kansas when voter turnout is low. Their worry is justifiable, and that’s why Kris Kobach has worked so hard to disenfranchise voters and to make registering to vote and the act of voting difficult and frightening for people of color and people whose priorities are living day to day. But, it doesn’t have to be. You can register to vote right now. You can apply for an advance ballot to vote by mail from home right now. You can encourage and assist 5, 10, or 50 others to vote right now. The only real question and the only real reason for worry is, will you? 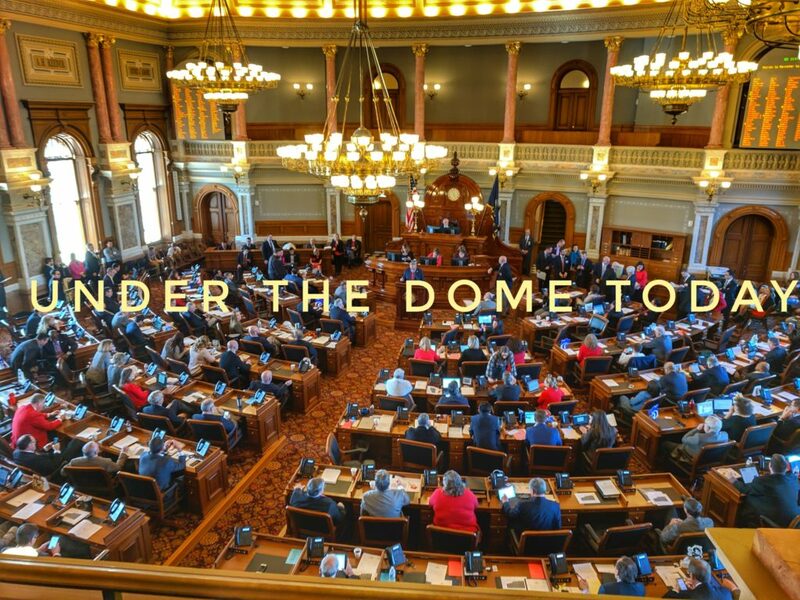 There has been wide reporting in the news media that Chris Haulmark, a candidate for Kansas House of Representatives District 15, has been accused of abusive relationships with women over a number of years and as late as 2017. Haulmark has denied many of the specific allegations but admits that he has had a history of troubled relationships with women exacerbated by anger issues. Haulmark has sought intensive therapy in dealing with these issues. 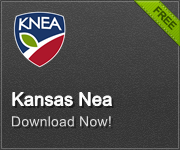 KNEA leaders and members of the Kansas NEA PAC have determined that there is doubt as to whether or not Mr. Haulmark has the temperament to serve in such an important position. To that end, the Kansas NEA PAC has decided to withdraw its recommendation of Mr. Haulmark for election to the Kansas House. We sincerely hope that Mr. Haulmark continues to seek help with these issues and can build healthy and respectful relationships in the future. Additionally, we hope that the victims of abuse receive support services to assist them in dealing with the trauma of abuse. To read more about this issue and the allegations, we would refer you to this report in the Kansas City Star.